Texas Tech University Press, 9780896728790, 182pp. "Preserving the collective memory of a community that is no more"
Seven decades after the Nazis annihilated the Jewish community of Tomaszow-Mazowiecki, Poland, comes a gripping eyewitness narrative told by one of the youngest survivors of the Holocaust, as well as through first-hand accounts of other Tomaszow survivors. 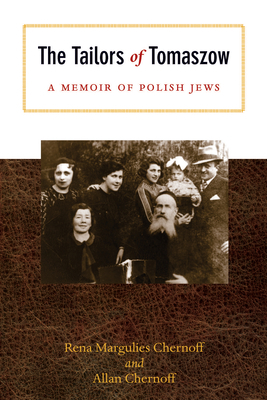 This unique communal memoir presents a rare view of Eastern European Jewry, before, during, and after World War II. It is both the memoir of a child and of a lost Jewish community, an unvarnished story in which disputes, controversy, and scandal all play a role in capturing the true flavor of life in this time and place. Nearly 14,000 Jews, one-third of the town's population, resided in Tomaszow-Mazowiecki before World War II, many making their living as tailors and seamstresses. Only 250 of them survived the Holocaust, in part because of their skill with a needle and thread. Engaging and highly accessible, "The Tailors of Tomaszow "is a powerful resource for educators and a compelling read for anyone wishing to gain a deeper, more personal understanding of Eastern European Jewry and the Holocaust. Rena Margulies Chernoff is among the youngest survivors of the Holocaust. She survived the Nazi destruction of Jewish Tomaszow, imprisonment in the slave labor camp Blizyn, and the terrors behind the barbed wire of Auschwitz-Birkenau. Years after the war she emigrated to the United States, earned a master s degree, and became a teacher. Allan Chernoff is a veteran of national network television news reporting. He served as CNN s Senior Correspondent for eleven years and has reported for CNBC and NBC News programs. He is the recipient of six best reporting awards from the Society of Professional Journalists New York Chapter and was a reporter on teams winning Peabody and DuPont Awards."